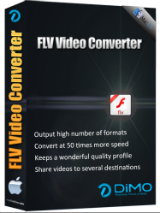 Dimo FLV Converter 4.2.0 (Win & Mac) was available as a giveaway on July 15, 2018! Your Must-have tool for SD/HD/4K FLV Video Processing - edit, convert, resize and share FLV (e.g. FLV to MP4, FLV to MP3, FLV to iPad, etc). How would you improve Dimo FLV Converter 4.2.0 (Win & Mac)? 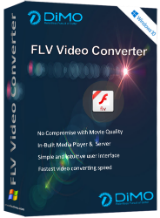 Your best-in-class Mac FLV video converter to convert FLV to more popular format, transcode FLV video to iPhone, iPad, Android, PS4, VR etc. The output presets are unrealistic and not related to the video dimensions or codec compression factors so if left at default values will invariably end up producing very big files compared to the input FLV video files in this case, the downloader is primitive at best and the server to stream media is a DUMB web server on a custom port and one is started for every path you define to be shared and there is no way to stop the dumb web server instances short of shutting down the entire program. No web browser included on any SmartTV can play the files listed and served from the server, it requires a dedicated video player like VLC on an android smartTV... not all smartTV's are android based so cannot install VLC for Android. IF you really want any Dimo video converters, and I can't see why you would... don't waste your computer space with their single format cut down products and just get the videomate product or wait until that is given away again... The output presets are unrealistic and not related to the video dimensions or codec compression factors so if left at default values will invariably end up producing very big files compared to the input FLV video files in this case, the downloader is primitive at best and the server to stream media is a DUMB web server on a custom port and one is started for every path you define to be shared and there is no way to stop the dumb web server instances short of shutting down the entire program. No web browser included on any SmartTV can play the files listed and served from the server, it requires a dedicated video player like VLC on an android smartTV... not all smartTV's are android based so cannot install VLC for Android. Is there any other converter on the market that only converts 1 type of file??? Also, their website list the price as $25.95, not the mendacious $49.95. Is there any other converter on the market that only converts 1 type of file??? Also, their website list the price as $25.95, not the mendacious $49.95. Having looked at every Dimo offering in the past, they consistently show that they are flawed and oh so slow. I really don't know how the company stays in existence when just about every paid and free offerings are superior. What is most alarming is that they show no signs of wanting to change and improve. Having looked at every Dimo offering in the past, they consistently show that they are flawed and oh so slow. I really don't know how the company stays in existence when just about every paid and free offerings are superior. What is most alarming is that they show no signs of wanting to change and improve. You don't need this if you downloaded Dimo MTS Converter. Great way to make money for this company using one program for many different formats. BTW, how can you upscale a .flv file to a 5.1 channel .mkv file?. I can see upscaling on a high=end A/V receiver, but how is it accomplished on a computer.? Jeff Dalls, Not enough icing to go around so they have to spread it thinly. DD, You are missing my point which is why does Dimo have separate pay for converters that accept only one format when the software it's based on (FFmpeg) accepts dozens of them? There is this one, another for Mts, another for Mkv, another for Mp4, another for Mxf and so on, plenty of freeware and other converter giveaways around that aren't so ridiculous.